A luxurious bracelet with malachite, jasper and brilliants. 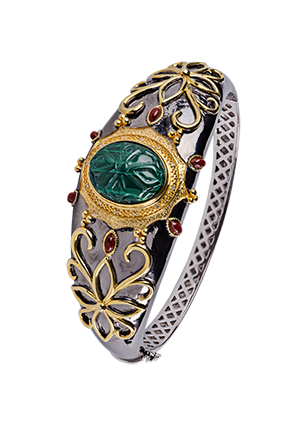 The stylized blossom carved into a bright green stone is second to none with a floral motif made of gold-plated metal. A contemporary shape and an unusual Oriental accent. Silver jewellery in Oriental style will go well with a semi-transparent evening gown, jacket in shades of brown or to a floral silk blouse.